Provide comfort for the family of Ronald Humphrey with a meaningful gesture of sympathy. Funeral services for Drumright resident, Ronald H. Humphrey, were held 10:30 a.m. Saturday, February 9, 2019 in the Drumright First Baptist Church. Pastor Roger White of New Pathways Baptist Church at Oak Grove officiated. Interment followed in the Drumright Oak Hill Cemetery. Funeral arrangements were entrusted to the care of Michael’s Funeral Home of Drumright. Ronald Henderson Humphrey was born in Okemah, Oklahoma on March 25, 1952 to Donald Henderson Humphrey & Ellen (Burton) Humphrey. He passed from this life in Tulsa on February 5, 2019 at the age of 66 years, 10 months, & 11 days. His family moved to Drumright when he was just an infant. He was raised & educated here & was a 1970 graduate of Drumright High School. He pursued a career as an educator & received his Bachelor’s Degree in education from East Central University where he also played baseball. His first teaching job was in Mannford and later he was hired by Drumright Public Schools where he remained for several years. He taught several subjects including history, driver’s education, and coached numerous sports. In 1999 he left Drumright schools. He retired in 2015 from Broken Arrow Public Schools. Ronnie loved teaching & had a passion for history & sports. He was preceded in death by his father. He leaves behind his CHILDREN: Chris-Anne Cunningham of Drumright – Shelby Humphrey & wife Alison of Pauls Valley – Summer Morris & husband Scott of Enid – Hannah Humphrey of Broken Arrow; GRANDCHILDREN: Kayla – Connor – Cherykee – Hali – Bryce – Brennan - & Avery; his MOTHER: Ellen Humphrey of Tulsa; & numerous other relatives & friends. Memorials in his name may be sent to: Bradley Elementary (Gym Floor Renovation) – 508 S. Skinner Ave. – Drumright, OK 74030. Online condolences may be expressed at www.MichaelsFuneralServices.com. 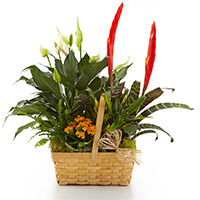 To send flowers in memory of Ronald H. Humphrey, please visit our Heartfelt Sympathies Store. Debbie,Dwayne,Karen,David, Troop F, and others have sent flowers to the family of Ronald H. Humphrey. I was very saddened to hear of Ronnie’s passing. I went to high school with him and thought he was one of the nicest guys in school. I’m remembering his family and those close to him in my prayers. May they all find comfort and peace in this difficult time. I'm so sorry to hear of your loss. My prayers are that God gives you comfort and peace during this most difficult time! Love to you all! Debbie,Dwayne,Karen,David purchased the Bountiful European Dish Garden for the family of Ronald Humphrey.